More news now from Wes Sanford at Northrop & Johnson as he sends word that he's signed the 33.22m motor yacht Diamond Girl for for sale. Built by Johnson Yachts in 2008 to a design by Dixon Yacht Design, Diamond Girl boasts an impeccable charter record. A light coloured sycamore interior sleeps up to 11 guests in five staterooms including an on-deck master suite while twin 2000hp MTU engines offer a range of 1,100 nautical miles at 12 knots. 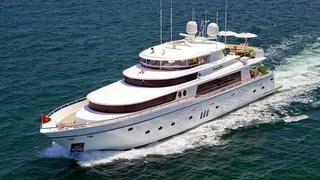 On display at the Fort Lauderdale show, Diamond Girl is asking $5,995,000.